with all our hearts, minds, souls, and strength. united in Jesus Christ our Lord and Savior. as well as dynamic classes for adults. and reading from God's Word. Come join us to strengthen your walk with God. the most important duties of Christians. of fellowship, sharing, and prayer. If you are planning to visit Pine Chapel Baptist Church for the first time, we hope that this page will answer some of your questions. You may take the entrance off of Queen Street, which is near the church sign. This will take you to the visitor parking area. It is best to arrive by 9:30 for Sunday School, and 10:45 for morning worship. Every door in the building will be unlocked, and you may enter through the side door under the awning, the door to the Fellowship Hall, or the side door facing Power Plant Parkway. You will be greeted by a member of our Welcome team as you arrive. They will assist you with any questions or needs that you may have. Transportation service and Child Care are available for all church events. Please call our church office at (757) 838-2758 for details. Feel free to dress comfortably. We are an informal church and accept people as they are. Pine Chapel is a great mixture of people from different backgrounds. While some people dress up, others will wear casual clothes. Wednesday nights are always casual. Just come and experience God's love, and don't worry about the clothes. We also take our responsibility to both teach them about Jesus and keep them safe very seriously. Our childrenare invited and encouraged to attend our classes designed just for them during the worship service. This allows the parent to focus on worship and allows your children the freedom to move around, have fun and learn about Jesus all at the same time. We also have a nursery for children from birth to 3 years of age. We have all had a 'first day' at church, and you'll find we are a friendly bunch. Our aim is that whether you are just looking into Christianity for the first time or have been a Christian for many years that you should be encouraged and inspired by the service. We hope that everyone will draw closer to God. We're not perfect and we do make mistakes, but we desire to make a positive difference in everything we do. To further encourage us, we have a Wednesday night service. This is a great way to get to know others in the church and to be real with each other about everyday living. You'll find other people also exploring God for the first time. Please explore the rest of this website so that you will have a good idea about what to expect on Sundays and throughout the week. We Believe † There is only one true and Living God. † God exists as Father, Son, and Holy Spirit. † Jesus is returning soon for His Own. the Southern Baptist Convention, and the Southern Baptist Conservatives of Virginia. 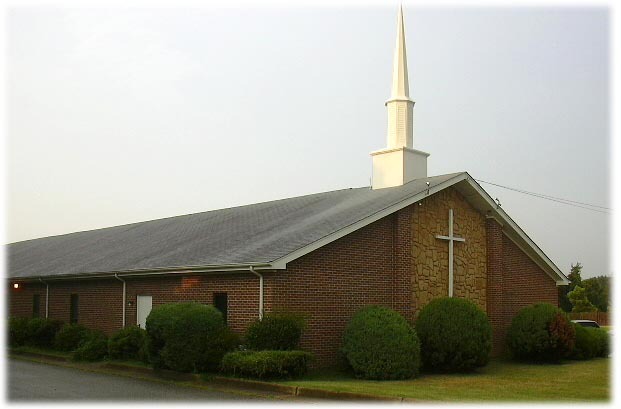 Pine Chapel Baptist Church began May 1938, as a Mission Sunday School. The Sunday School met weekly and the worship services were held monthly by one of Hampton’s ministers. In 1939 the Mission purchased land and built a chapel at 198 Pine Chapel road (known as Speegle Village). 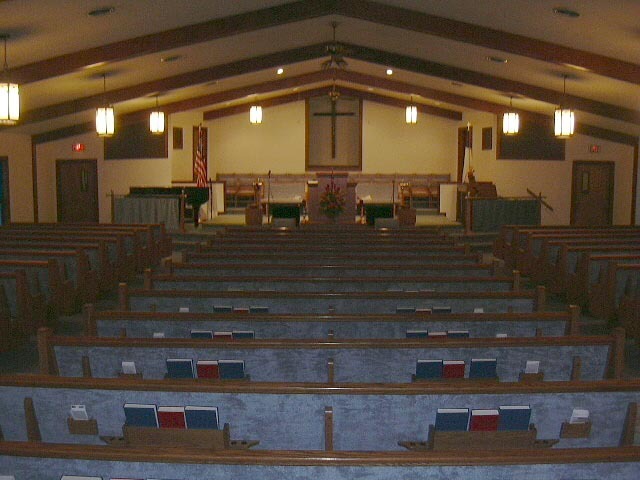 The congregation donated time and labor to build it. The chapel was completed in 1940. On January 3, 1941 fire destroyed Speegle Village Baptist Church (Pine Chapel Baptist) and its contents. Plans began immediately for a new building which was completed and dedicated February 22, 1942. On May 24, 1942 the Mission was organized into a church. This was the beginning of what is now Pine Chapel Baptist Church. It started with 42 members. Reverend C.L. Fisher was called to be the first pastor May 31, 1942. Reverend Fisher and his wife would not accept any salary until the church was paid for. He worked at the Newport News Shipyard in the day and at the church at night. The Church submitted a petition for membership in the Peninsula Association on May 4, 1943. 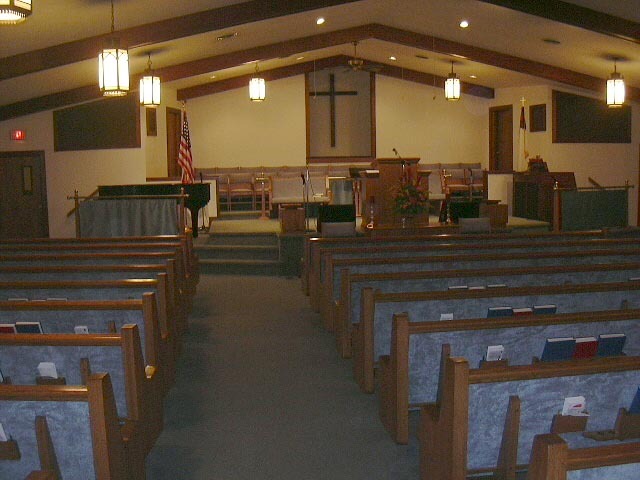 Pine Chapel was accepted at the next association meeting. By 1943 membership was 75 with 136 members in Sunday School. In 1944 the church membership had increased to 91. During 1946 and 1947 the church averaged 15-20 new members. By 1948 the church membership was 156 with 189 in Sunday School. The church library was begun in June of 1946. It was named the Ballew Memorial Library in memory of Mr. A.H. Ballew, charter member and deacon, and for Mrs. Ethel S. Ballew. Reverend Fisher resigned November 9, 1947 and on December 1, 1947 Reverend Samuel Union, Jr. was called to be Pine Chapel’s second pastor. Reverend Union also worked in the Shipyard. Membership continued to grow, so in the fall of 1948 plans for a new sanctuary were drawn up. The cornerstone was laid in September by Mr. L.O. Savage, Mr. J.J. Kiker and Mr. T. A. Kilpatrick. Reverend Union resigned as pastor June 16, 1954 feeling the church needed a full-time pastor. On June 20, 1954, Reverend John E. Barrow accepted the call to be Pine Chapel’s first full time pastor. During his pastorate, the congregation grew to 304. With the growth of the membership, there was a need for more space. A youth building was built and dedicated in January 1955. Reverend Barrow resigned October 2, 1955 and the church called Reverend L.W. Gill on December 18, 1955. During the four and a half years Reverend Gill served, the membership grew from 304 to 544. Reverend Gill resigned in 1960, feeling he had fulfilled God’s purpose for him at Pine Chapel. On July 1, 1960, Reverend R.C. Shearin accepted the call to be pastor. During his first year, 142 new members were added to the membership. A deaf Bible Class was started on September 13, 1963. The Sunday School and worship services to were interpreted. This was the first such service to be started on the Peninsula. The first paid Minister of Music, Mrs. Delbert Taylor, was hired in November 1964. For three years she brought inspiration to the worship service through her music and singing. While still serving as pastor, Reverend Shearin had a heart attack and died September 17, 1969. Reverend Fisher returned and served as interim pastor until Reverend George Wollett, Jr. was called April 7, 1969. In 1973 the church hired a summer educational worker to work with the children and youth, the summer worker was Miss Alice Faye Pool. She brought spiritual guidance to the children and exciting games, crafts and stories that continue to remain in their memories. A decline in attendance began in the sixties and continued into the seventies. There were some problems that arose among the members that led to some of the members leaving and later forming Coliseum Baptist Church. Reverend Wollett left Pine Chapel on July 30, 1978. The church was led the following ten months by determination and dedication from the deacons. The pulpit was filled by different people until Reverend Ernest Myers was called on June 1, 1979. With the arrival of Reverend Myers, the church began a spectacular growth in all areas of church ministry. On September 11, 1980, the Long-Range Planning Committee recommended the church sell the building and purchase new land at 1544 West Queen Street. Construction began on the new building June 21, 1982 and was completed November 14, 1982. A dedication service was held on December 6, 1982 and the children’s wing was named in memory of Reverend C. L. Fisher, the first pastor of Pine Chapel. On September 11, 1983, the Church hired a part-time Associate Pastor/Youth Minister, Fred Lane. His work greatly improved our youth department, numerically and in spiritual growth. Fred left in July, 1984 to take a full time position in Virginia Beach. Tom Nidifer became our Music Director in April, 1985 and quickly led our music program in new and exciting directions until he too left to take a full time position in December, 1987. Jan Smithson became Youth Director in May, 1985 and rapidly won a place in our hearts until she left in June, 1989 to go back to school. Paul Lewis became our Music Director on February, 1988 and has ably led our music program from that date. He and his family continue to be a real asset in all areas of church life. Ernie Myers left Pine Chapel in September, 1990 to take over the Pastorate at Deep Creek Baptist. Our sadness over losing this fine man of God and his family was tempered by our rejoicing over the growth of his personal ministry. Reverend Don Stroud did a fine job as Interim Pastor and the spiritual well being of the church remained high, thanks to his efforts and the pulling together in harmony and hard work by our fellowship. Keith Ellen was Youth Director from June, 1990 until March, 1991 and Jerry Paxton in June and July, 1991. Though their time with us was short they both did a fine job. This history would not be complete without thanking Mrs. Dorothy Cook our Church Secretary who has been invaluable in her service to us for over 22 years. On June 1, 1991 Dr. Don Jones became pastor of our church and he and his family immediately became an integral part of the fellowship of our church. 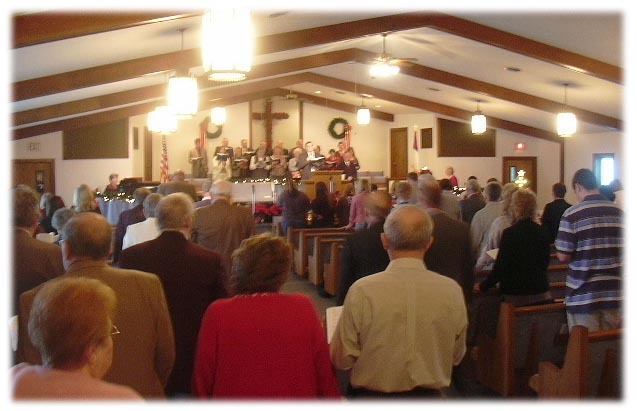 During this time, the church debt was reduced to $133,730; one loan to the Virginia Baptist Extension Board was paid off; a new roof and new sign were installed, being replaced because of wind damage; a new septic tank installed; and new office equipment purchased, including a computer and copy machine. Dr. Jones served the church three years, until September 1994. October 1, 1994’s membership was 692 with 309 being resident members; Sunday School enrollment was 137 with average attendance of 51; and Woman’s Missionary Union had 3 officers and 14 members. The Lottie Moon Christmas offering was $1,704.00 in December 1994. Dr. Tew accepted the call as Interim Pastor November 21, 1994 until September 1995. During his call an interim pastor his hard work and dedication was greatly appreciated. Dr. Tew holds a special place in our hearts and prayers. Reverend Ronnie Snead was called to pastor Pine Chapel Baptist Church in September 1995. He served the church until May 2000, a total of four and half years. During this time, the church debt of $106,000.00 was paid in full and a building fund was established. A steering committee was formed to review the possibility of renovation and addition to the church. As of December 2000 a total of over $55,900.00 was in the fund. Under Reverend Ronnie Snead’s guidance and leadership, Billy Owen, Greg Crabb and Allan Passaro were ordained as Deacons of Pine Chapel Baptist Church. In June 2000, Reverend Frank Earwood accepted the call as Interim Pastor and served until October 2001. We greatly honor Reverend Earwood and his wife Marie as they became members of Pine Chapel Baptist Church. Reverend Earwood provided leadership, hard work, created unity, and brought GOD's word to us in a very special way during his call as Interim Pastor. November 2001 brought Reverend Richard Dorman to Pine Chapel as he accepted and became pastor with emphasis on a strong ministry in evangelism and children's church. He served the church until May 2004, a total of two and a half years. During this time, the church hired Chris Grohman, who was ordanined and served the church as the Associate Pastor of Youth. Renovation of the choir/youth room was done during this period of time. In June 2004, once again Reverend Frank Earwood answered the call to be our Interim Pastor and served until December 2005. During this time, the pulpit area in our santuary was renovated and the kitchen was remodeled. Reverend Earwood provided healing, created unity, and provided encouraging messages from GOD's word to us during his call as Interim Pastor. 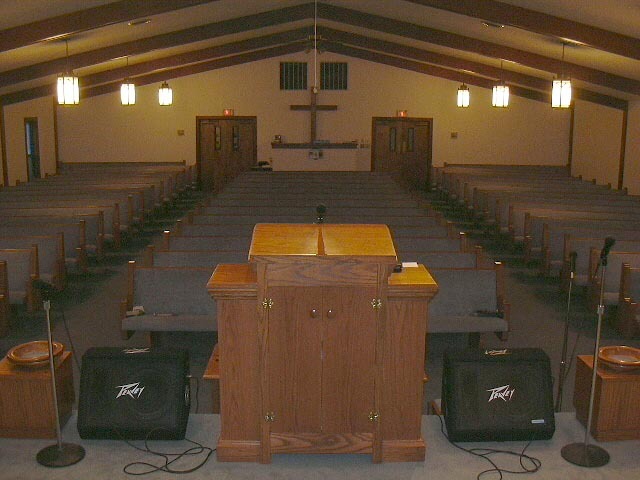 On January 1, 2006, Reverend Mark Reon began his ministry at Pine Chapel. Reverend Reon has brought strong moral and family values to Pine Chapel, along with the belief that the Bible is the inspired Word of God and without error, and that the church is the body of Christ. He believes in loving and caring for one another, reaching the lost, and sharing his love for JESUS. Pastor Frank served in various capacities after Pastor Mark's arrival, including ministering at children's parties and leading the youth Sunday school class. In February 2006, Associate Pastor of Youth Chris Grohman and his family left Pine Chapel and returned to their home state of Pennsylvania. In June 2006, Penny Jones accepted the call to become the Youth Director at Pine Chapel. Penny brings to the church her love of JESUS, her enthusiasm for serving and ministering to the youth, and her dedication in serving Christ. Randy Fields served as Interim from April until September 2009, at which time he returned to the mission field. The church formed a special bond with the Fields family and decided to financially and spiritually support them in their ministry. Rev. Allen Hopkins accepted the call to be PCBC Pastor, beginning October 18, 2009. Just recently, Pastor Hopkins felt that it was time for him to retire and enjoy time with his wife, Faye. Pastor Hopkins may no longer be getting up early to come into the church office but pastors never really retire!